James Harden in the wake of the elbow smash from Metta World Peace. With a new name and a new outlook on life, Ron Artest AKA Metta World Peace was supposed to be a new man. He’s always been a conscientious guy, but he was going to be a better teammate, a better player, and an overall better person. However, with one cheap shot last night, he may have undone all the good things he’s been trying to do this year. 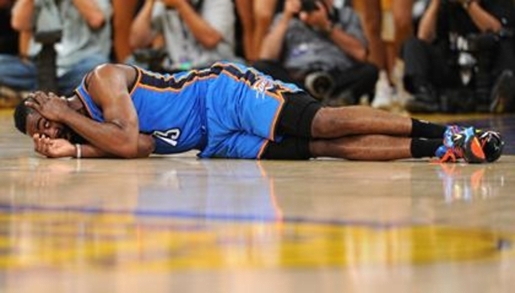 After a huge dunk over Kevin Durant and Serge Ibaka during the second quarter of last night’s double-overtime game between the Oklahoma City Thunder and LA Lakers, World Peace was running back up the court when he ran into James Harden and gave him an elbow-smash that would not have been out of place in the WWE. If you didn’t see it, the video is below. Warning: it’s pretty nasty. James Harden was on the floor for about a minute before he was able to be taken off the court. As for Artest/World Peace, he was thrown out of the game. The Lakers won 114-106 in double overtime, but with one game left in the regular season, that’s a terrible time to get a suspension for multiple games. It’s also a terrible time to take an elbow to the face and get a serious concussion; then again, there’s never a good time to get your brain scrambled.